If you are having trouble finding other players or you want to promote a local gaming group, please post your details here. Seeing as I'll be in Osaka for the foreseeable future, and considering that it's not practical to go to Nagoya every month for gaming, I've decided to make more of an effort to find games based in Kansai. One store near Tennouji, Higacchi Games, seems to have monthly 40k events and a space for games at any other time. Yellow Submarine in Kyoto also seems to have regular 40k games, but I haven't looked too much into it yet. Anyway, I attended the Higacchi Games event today, so here's an after-action report! 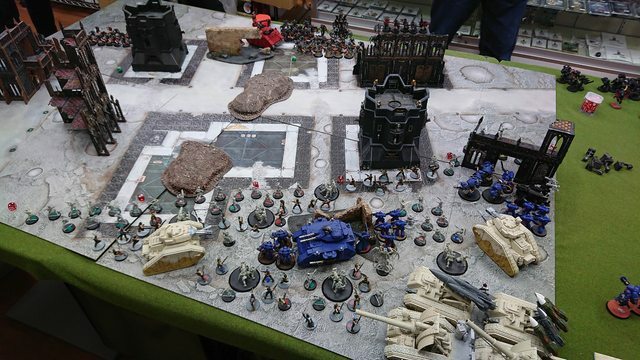 I brought 1500 points of an infantry-heavy Imperial Guard gunline and was partnered with an elite Ultramarine army. 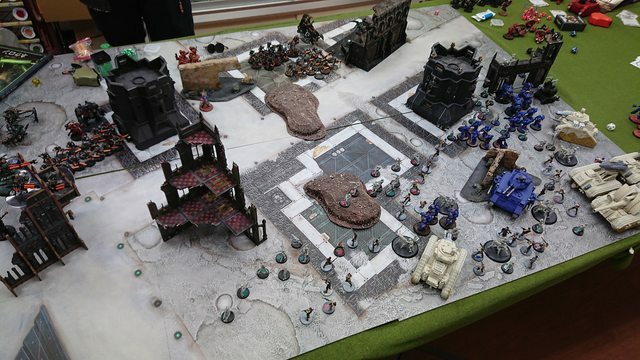 Against us were 3000 points of Necrons and deep striking Blood Angels (ah, a lore-friendly alliance!). We played for kill points, deploying in table corners. The traitors went first and scored first blood against one of my infantry squads. Scout snipers tried to pick off Sergeant Harker buffing my artillery parking lot, but she saved like a boss. We returned fire, destroying the snipers, a squad of marines, and half a squad of wraiths. I also moved up some of the infantry squads to enlarge the picketline. In turn two, the Blood Angels player elected to only deep strike in one unit, as my thick wall of guardswomen denied any charges against more valuable targets. They charged and wiped out one more infantry squad, while necron shooting continued to pick away at the troops. The surviving wraiths charged and tore apart a few more girls, but the unit endured the morale test. On our turn two, we shot the wraiths and deep strikers off the board, leaving the middle of the board devoid of units. On turn three, the rest of the blood angels came in and found a path to charge, killing some marines and their librarian. We used our turn three to fall back from combat and unleash rapid fire lasguns / bolters into the traitor blood angels. Then, to wrack up a kill point lead, we focus fired our armor on an annihilation barge and dreadnought, destroying both. 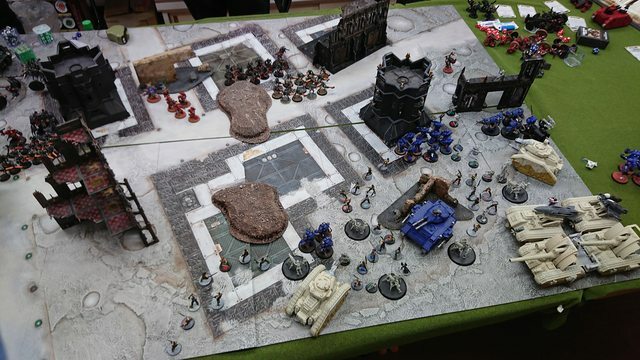 The game ended at the end of turn 3 with an Imperial Guard / Ultramarine victory of 10 - 7. The combination of cheap guardswomen with a heavy gunline worked out very well. Gaps in the front line could immediately be filled with reserve troops from a second inner line with heavy weapons. My artillery pieces caused considerable damage to the opposition and were essentially unmolested all game. I did benefit from the shorter game length since I brought manticores and my troops were starting to thin out, but the enemy had no melee units left alive to exploit holes in the line. Edit: now with some pictures! You can't spell slaughter without laughter. I follow Higacchi Games on Twitter! Seems like a cool place. Glad you found a nice place for a game and that you had a good time. But why are your tanks pointed at your own troops!! That is definitely one way to make them not flee the battle. @Dave: Yeah, I've been keeping an eye on them on Twitter too! The play area on the second floor is kind of small, but it's enough for 2 simultaneous games of 40k I reckon. @kojibear: Sounds like you answered your own question.